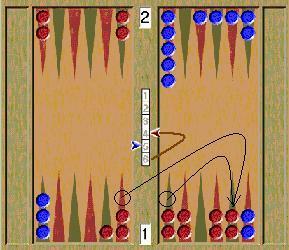 No Chance Backgammon ("Zarsiz Tavla" in Turkish) was invented by Naim Çagman in 2002. There is no element of chance in this game because it does not use dice. 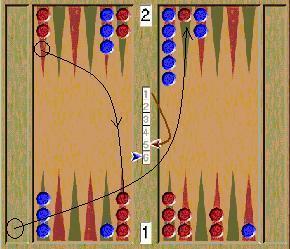 Instead, players choose their own numbers under certain constraints in full view of the opponent. 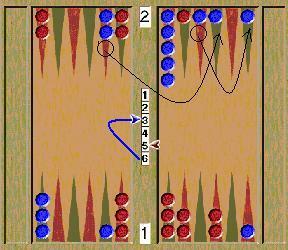 Each player knows the strategies of the other player as well as their own and it turns backgammon into a pure skill game similar to chess. 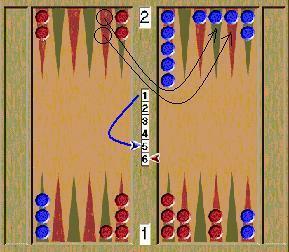 No Chance Backgammon uses a standard backgammon board with 30 checkers. 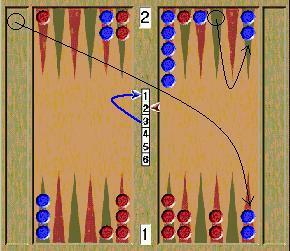 The rules for moving the checkers are the same as in standard backgammon. The only difference is that No Chance Backgammon has no dice. In order to play the game, you need a pair of numbers. 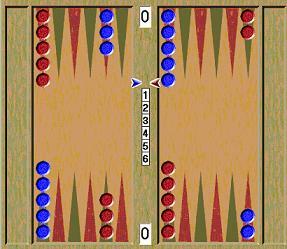 Instead of dice, six numbers are written on the bar of a standard backgammon board. 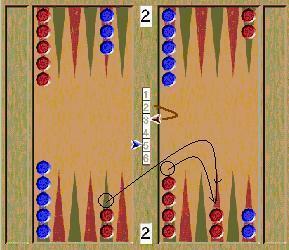 The Red player has a red arrow and the Blue player has a blue arrow to indicate each player's number, as shown below. Six numbers are drawn on the bar and there are two arrows, one for each player. 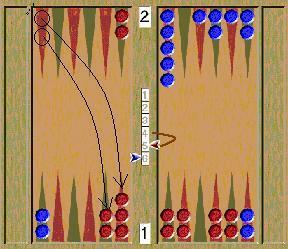 The players decide by drawing lots who is to go first. 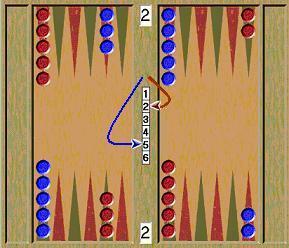 The first player chooses a number from 1 to 6 and moves his arrow to indicate his chosen number. Then the other player chooses a different number and moves his arrow to indicate the number. This establishes the starting values for the arrows. Now it is the first player's turn. When it is your turn, you move your arrow to a new number. You must choose a number that is different than your own previous number. And normally you choose a number that is also different than your opponent's number. 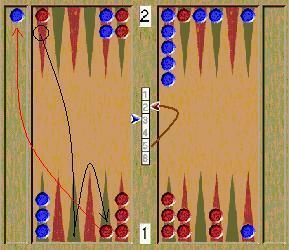 However, twice per game you may choose "doubles", selecting the same number as your opponent. The two arrows form a pair of numbers to be played in the normal way. Once you have played your checkers according to the shown numbers, your turn is over. 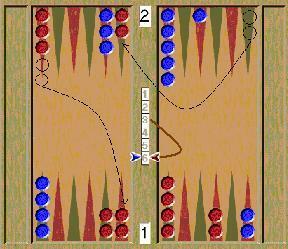 Players alternate turns and the game continues in this way until it is finished. Start: Let's say Red wins the toss and chooses number 2 from the six numbers. Then Blue chooses number 5 from the remaining numbers. So the starting values of the arrows are 2 and 5. Red's Turn: Red chooses number 3 from the remaining numbers and moves his arrow from 2 to 3 to indicate his choice. He now has a 3-5 to play and moves his checkers according to those numbers. Blue's Turn: Blue chooses 6, which is different than either number of the previous pair. 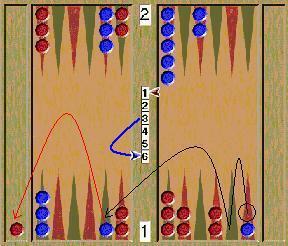 He moves his arrow to 6 to create the new pair, 3-6, and moves his checkers according to those numbers. Red's Turn: Red chooses number 6, which is the same as Blue's number. (Each player may do this only twice per game.) 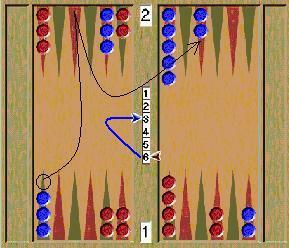 Red now has a "doubles" roll to play, 6-6, which he plays as follows. Blue's Turn: Blue chooses number 3, creating the pair 6-3, and plays as follows. 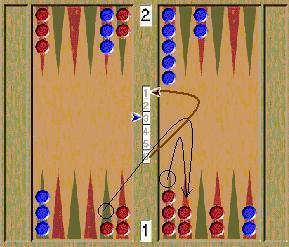 Red's Turn: Red chooses 1, creating the pair 1-3, and plays as follows. Red's Turn: Blue chooses 6, and plays 1-6 as follows. Blue's Turn: Red chooses 5, and plays 5-6 as follows. 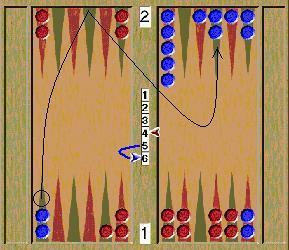 Blue's Turn: Blue chooses 3, and plays 5-3 as follows. 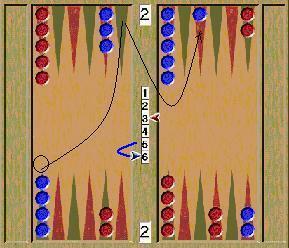 Red's Turn: Red chooses 2, and plays 2-3 as follows. 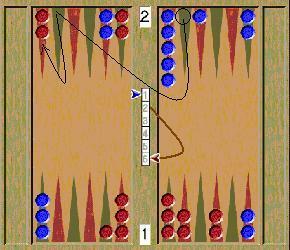 Blue's Turn: Blue chooses 1, and plays 2-1 as follows. Red's Turn: Red chooses 6, and plays 6-1 as follows. Blue's Turn: Blue chooses 5, and and plays 6-5 as follows. Red's Turn: Red chooses 4, and plays 4-5 as follows. Blue's Turn: Blue chooses 6, and plays 4-6 as follows. Red's Turn: Red chooses 5, and plays 5-6 as follows. And so on. This continues until game is finished.